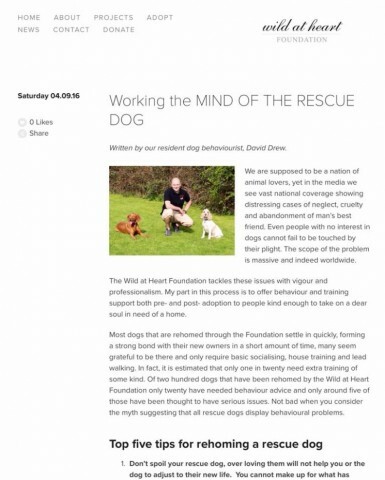 David writes an article about working with the mind of the rescue dog for The Wild at Heart Foundation, he describes how he goes about starting the process of helping a rescue dog and things that need consideration in their behaviour modification. There are five top tips for rehoming a rescue dog included, the article is both interesting and informative and well worth a read, it has been a real success and received more ‘likes’ on their Facebook page than any other article written! There is a donate button on The Wild at Heart Foundation website for anyone wishing to contribute to this fantastic cause.